Leading up to this, Trig took down London Conspiracy and Panthera overcame Team Dignitas to reach the Week 1 finals match. We saw interesting picks for Game 1 with iRaffer from Panthera picking up Thanatos as their Support. 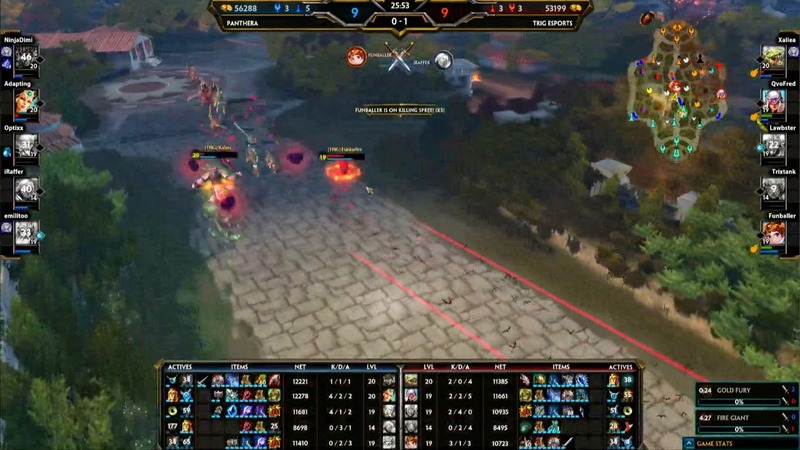 This leads into emilitoo (Xbalanque) joining him in the duo lane against Trig's TrixTank (Hercules) and Funballer (Apollo). Action kicks in with Trig's Lawbster (Ra) hitting a perfect snipe on Adapting (Bastet) followed by a Celestial Beam taking him down. This was only the beginning as we see a blood bath break out in the left-mid lane with a total of five players down which ended with a double kill by Panthera's NinjaDimi (Poseidon). 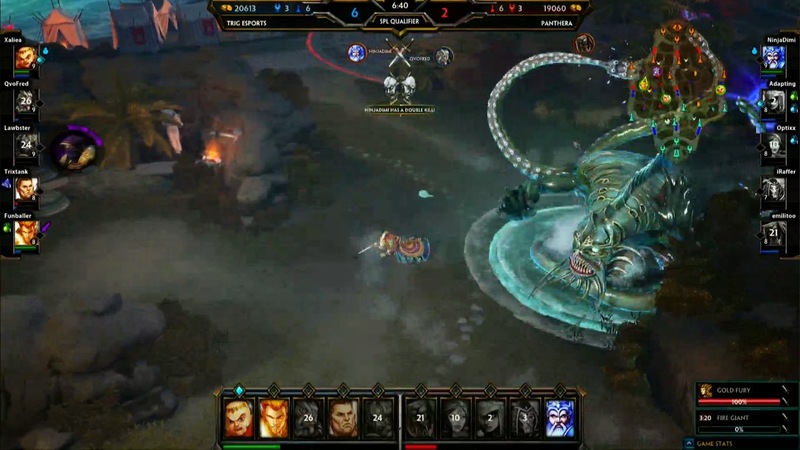 Later on in Game 1 we keep seeing kill after kill with a strong lead by Trig's QvoFred (Ao Kuang). This eventually leads to a surrender vote by Panthera, ending Game 1 at the 23 minute mark. 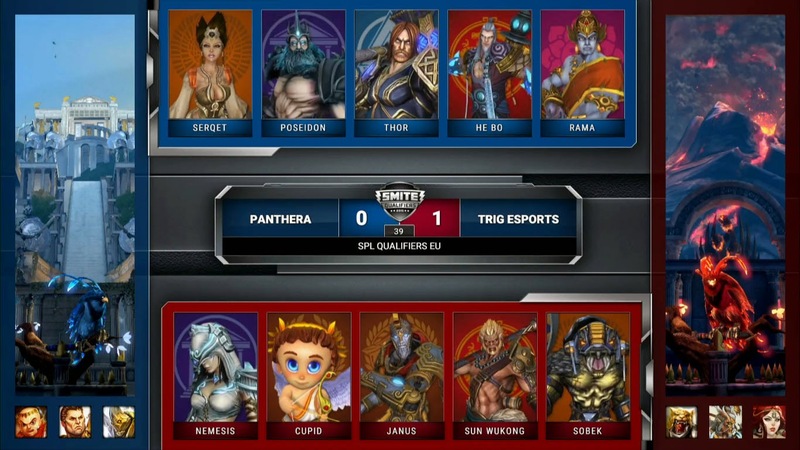 Game 2 commences in the best two out of three series with Panthera picking Serqet followed by a Nemesis for Trig. Panthera decides to remove all chances of playing against Vamana and Hercules again by banning them followed by a similar minded Trig who gets rid of Xbalanque. Panthera is hitting hard during the first 20 minutes of Game 2, trying to start a huge fight every chance possible. We see Panthera's Emilitoo (Poseidon) along with Optixx (He Bo) taking on a 3,000 gold investment to secure Rod of Tahuti which helps with the teams overall motion in trying to snowball. Despite that, the upper-hand is seen in favor of Trig because with one huge team fight, they could potentially secure the game. At this point Panthera doesn't have a strong tower pressure or an optional backdoor while Trig has many open possibilities. Coming up at the 25 minute mark we have a giant brawl that starts up! Trig goes for the Fire Giant but encounters a Crushing Wave by He Bo which after another hit takes down TrixTank (Sun Wukong). The confident He Bo is instantly gone due to a swift attack by QvoFred (Nemesis). 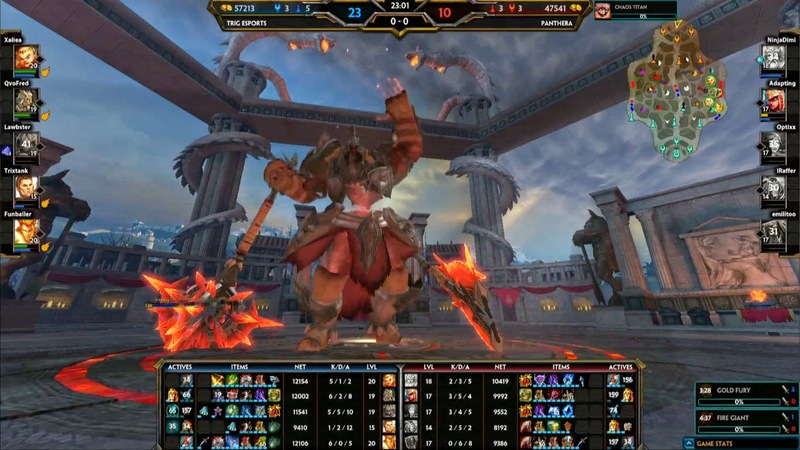 Trig secures the Fire Giant but not before Xaliea (Sobek) can kill Panthera's Poseidon and take down the opposing NinjaDimi (Rama) securing the Double Kill. The fighting is still not over as a level 14 iRaffer (Thor) goes for the risky ult against the level 20 Sobek and Funballer (Cupid)! Thor tries securing the kill with a Berserker Barrage but miss-times an Aegis used against Cupid's Heart Bomb. This takes Thor down leaving a huge spot for progression in favor of Trig. Four minutes later we see the game come to an end with Trig taking down the Left and Middle Phoenix, destroying all opponents that come in their way! Thor tries to hold his ground but falls to the hand of the enemy Cupid. 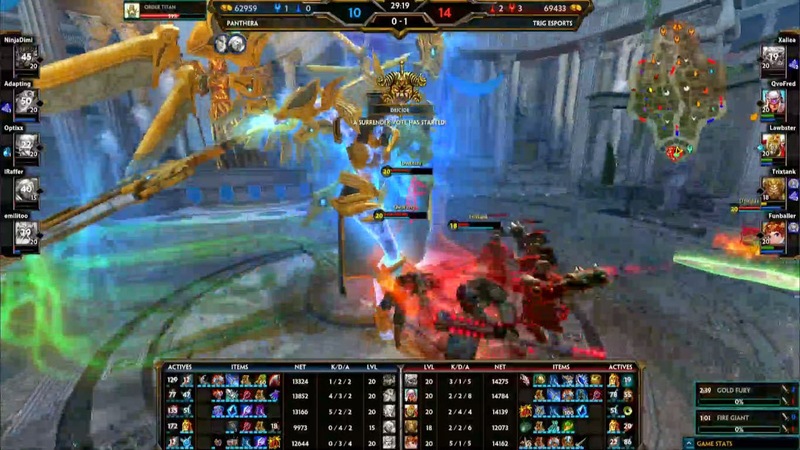 Trig charges the Titan and secures the match while a Surrender Vote commences from Panthera. 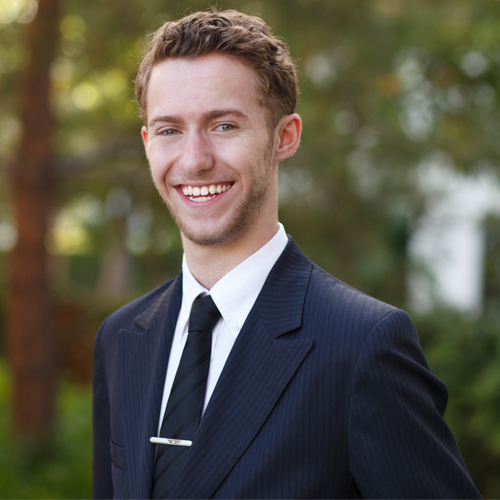 What a great way to end Week 1 of the European Smite Pro League Qualifiers. A great match between two teams which led to Trip eSports coming out on top with the First Place position. With Week 1 at a close, the SMITE community waits anxiously for Week 2 to arrive and bring new matches full of teeth-chattering plays and heart-stopping matches. If you would like to watch the matches between Trig eSports and Panthera, click here and skip to 03:05:40. Here is a recap of what points were awarded to what teams for both US and EU throughout the week.